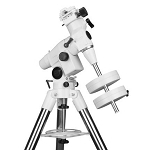 This Skywatcher Pier with three races has been made for EQ6 and NEQ6 mount. Replaced the classic tripod gives a greater strength and stability to the mount, especially for those who want to use it for astrophotography. Also useful for those who need a higher position of the mount. 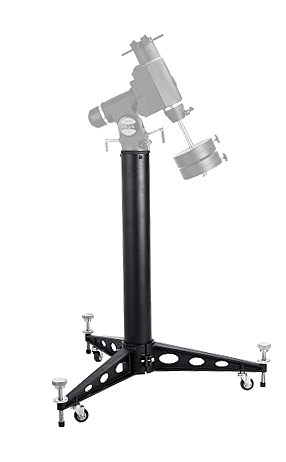 The three legs of the column are positioned at 120 ° one from the other, its height is 81cm, the feet are adjustable in order to level out the best column whatever the condition of the surface. 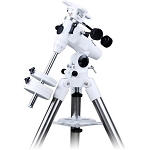 Suitable for all Skywatcher EQ6 mount and all mounts with the same tripod connection, like EQ6-R, AZ-EQ6, NEQ6 and also Celestron CGEM. The beams can be separated from the center pier, thus transporting becomes easier. 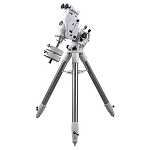 The stability is comparable with the one of a massive stainless steel tripod. 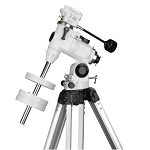 Longer telescopes can be rotated freely. 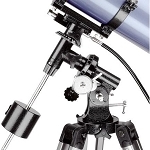 Rollers allow easy transportation of the entire telescope on flat surfaces. Simply roll the telescope out of the garage. With the levelling screws at the outer ends of the beams, the rollers can be lifted from the ground and the pier gets a solid stand.